Miss Bates loves pie, apple, cherry, strawberry-rhubarb, but nothing beats humble pie. She happily munches on it after sneering, snarling, and dramatically slapping her forehead with “What was I thinking?” reading Jodi Thomas’s Ransom Canyon – it’s women’s fiction. More fool Miss Bates because Thomas’s novel has as much going for it as it does going on. Ransom Canyon is braided with three narrative strands: the romance between dour, tragic Staten Kirkland, rancher, and Quinn O’Grady, lavender farmer, reclusive pianist, and his dead wife’s best friend; the burgeoning feelings between Lucas Reyes, ambitious teen-ager and hand at Staten’s ranch, and Lauren Brigman, dreamy girl and sheriff’s daughter; and, Yancy Grey, ex-con and handyman to the adorable old coots, all former teachers, at the local retirement home. Add the blue-cape-swirling, curvaceous, sharp-tongued Miss Ellie, nurse-in-training, and frequent visitor to the retirement home and Yancy Grey, at 25, newly released from the big house, has himself a serious case of desire. Ransom Canyon is set in Texas ranching country, in the allegorically-named town of Crossroads, not far from Lubbock. Thomas weaves the three story-lines beautifully, offering redemption, renewal, and love to the broken and troubled – and leaving pending romance threads in the stories of the young ones, Yancy and Ellie, Lucas and Lauren. Miss Bates began Ransom Canyon with trepidation, partly because of its “women’s fiction” label, equally because she found the prose flat and distancing. There was a dip in her heart there wouldn’t be enough romance when it opened with the middle-aged lovers, Staten and Quinn. Staten’s story is tragic: his beloved wife sickened and died and then his 16-year-old son was killed in a car crash. He works his ranch, loving and caring for the land, his animals, and the men who work for him. A few times a month, he drives to Quinn O’Grady’s farm to make love. He never stays the night. He cares for her, is her friend, but his heart is closed. He’s a gentle giant of a man, but he protects his heart from ever breaking again. Quinn has loved him forever, but she knows she cannot ask him for what he cannot give: love and commitment. Quinn too, reclusive as she is, carries a world of fear within. Only Staten can touch her heart, or body. She lives alone and content, rarely venturing beyond her farm, never contacting Staten, or he her, beyond those stolen, gentle, quiet episodes of love-making. Miss Bates loved the tender shift in their relationship when Quinn asks Staten to start kissing her good-bye every time he leaves. She knows their affair will end one day and she wants every time, if it’s to be the last, to end with a kiss. Quinn’s serene, sweet-tempered ways have already laid claim to Staten’s heart: it’s only a matter for them both to discover. Lucas Reyes is a young man who aims solely towards the future; a hard-working student, an excellent ranch hand, his only thought to go to college and take care of his large and straitened family. With the exception of Lauren Brigman; 15 to his 18, their relationship is as gentle as is that of Quinn and Staten. They’re friends and share an understanding, an empathy as only sensitive, mature, thoughtful young people do. They’re caught in an escapade with the town’s wild, rich, stupid boy, Reid Collins. Reid’s foolishness leads them to trouble, but also binds them in a special way, ties them in more than friendship. A kiss and clasp of hands and Lucas knows he’ll be waiting for Lauren to grow up so he can claim her as his own. Yancy Grey walks into Crossroads, Texas, with the hope that his years in prison are behind him. He’s learned a few things: that he’s worthless and likely to re-offend, there’s no one in the world who cares for him, but he learned enough in prison to vow never to return. For that, he decides he needs a goal. It comes in the form of some adorable old folks at the retirement home, who take him on as general handyman. When one of their nieces shows up, the plumply delightful Miss Ellie, blood-pressure-sugar checker, Yancy’s enchanted. Miss Bates’ cynical side isn’t entirely convinced of Yancy’s fairy-tale reformation. But disenchantment isn’t what romance is about. It’s about faith and redemption through love. Yancy’s growth into a caring, funny, strangely innocent young man, despite all he’s done, is sympathetic and affirming. Ransom Canyon‘s flaw lies in its portrayal of caricaturish villains. Varmints show up; a nightmare from Quinn’s past makes his appearance. They’re dispatched by the forces of good: Staten’s protective love and steady hand, some feisty old folk wielding a hockey stick – really, in Texas! But even this quibbling point cannot deter the goodness of Thomas’s novel. Because, redundant as this sounds, Thomas’s quasi-romance novel is about goodness: how good people, with heart and care, defeat evil. How their own brokenness is healed by love, how forgiveness is easier than rancour. Maybe it’s naïve, maybe it’s simplistic, but Miss Bates would rather say this novel is hopeful, funny, and poignant. It’s vindication of good over evil, of the boy gone wrong, the girl a little lost, the woman held back by cruelty, the man diminished by grief. Miss Bate isn’t certain that her heart took over from her head and Thomas’s Ransom Canyon is as good as she’ll claim in her review, but she loved every word of it. And she’ll be back to Ransom Canyon for the rest of the novels in the series. Misses Bates and Austen say of Jodi Thomas’s Ransom Canyon, here is evidence of “a mind lively and at ease,” Emma. 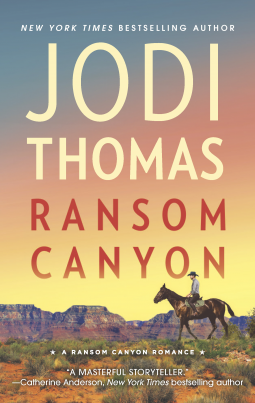 Jodi Thomas’s Ransom Canyon, first in her new series, is published by HQN Books. It’s been available since August 25th and may be purchased from your preferred vendors. Miss Bates received an e-ARC from HQN, via Netgalley.